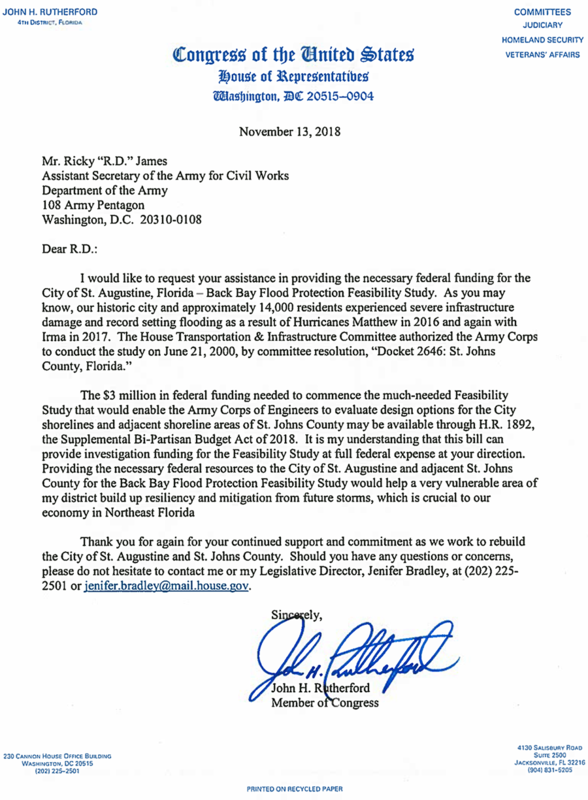 In January, St. Augustine Mayor Nancy Shaver went to Washington D.C. to speak with Senator Marco Rubio, Congressman John Rutherford, Congressman Michael Waltz and the staff of Congresswoman Stephanie Murphy to ask for support as the city looks to acquire federal funding for what’s known as a back bay feasibility study. The study would look at storm surge and the impacts of sea level rise on the interior areas of St. Augustine. “Essentially, what this study will do, is it will look at various alternatives that maybe could minimize some of those impacts they may see down the road, or to minimize impacts they’ve already seen,” said Jason Harrah, Project Manager with the U.S. Army Corps of Engineers. He said the study itself has already been authorized by Congress, the Army Corps is just waiting for the funding to be approved. Mayor Shaver said getting that approval is a priority for her this year. Shaver is aware that the Army Corps receives dozens, if not hundreds, of study requests every year. But, she said St. Augustine should be a priority. That’s why he has come out in support of St. Augustine’s push for federal aid. He recently wrote a letter to the Assistant Secretary of the Army for Civil Works, which appears at the bottom of this story. Congressman Rutherford said he hopes the funding can be secured within the next six months so the study can begin as soon as possible. He believes there will be plenty of support on Capitol Hill. If the appropriations request is approved, the cost will be split 50/50 between the City of St. Augustine and the federal government. Harrah said the study itself could take two to three years to complete. The City of St. Augustine would have to match federal funding for each of those phases as well. According to Harrah, the design phase usually takes about a year to finish and construction could take a year or two to wrap up. “I would say if everything lined up, with all the appropriations and the authorizations, you could be under construction within four to five years,” he said. But, Harrah said, Congress can always expedite the process. And he hopes that will be the case for St. Augustine. The City of Atlantic Beach is proactively addressing sea level rise and climate adaptation by developing a coastal vulnerability assessment and adaptation plan.